If you are interested in booking any of the comedians that are featured on this website please email me at mullaney3@blueyonder.co.uk and I will be happy to pass on your enquiry. 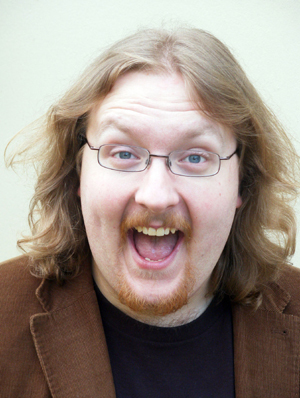 Ben Schofield first performed as a comedian in 2001. Hailing from Bradford, he was, from an early age, to foster a keen sense of humour as a simple defence mechanism. His predilection for mirth-making thrives to this day, which, considering he still lives in Bradford, is just as well. Ever since his first tentative steps into comedy before a home crowd in Bradford he has performed to audience and critical acclaim in venues across the north of England. A dyed-in-the-wool rocker, he has imbued his performances with his rock and roll spirit, producing a dynamic, colourful (and really quite loud) act that is guaranteed to entertain. In 2002 he reached the televised semi-final of the BBC New Comedy Awards, only for his progress to be hampered by the London audience inexplicably taking objection to having a hairy Northerner shouting at them. Undeterred, he continued to preach his gospel to all who would listen, building a deserved reputation as an exciting and engaging comic performer, whilst vowing never to enter a competition again. Such was the piety with which he upheld this vow that in 2004 he reached the regional finals of the J2O/Jongleurs competition. A scatologically cerebral comic thinker with a keen eye for the absurd, he boastfully maintains the unique record of being the only comedian in the world (to his knowledge) to have written a joke about galvanising dustbins. This surely stands as a testament to his ability to mine comedy gold from even the most unlikely of seams. With countless performances in top northern venues, residencies at several established and respected comedy nights (including the Hyena Lounge at The Original Oak, Headingley and the Saturday Session at The HiFi Club, Leeds) and several television appearances (including Stand Up Britain for ITV) already under the considerable girth of his belt, he is all set to ignite a comedy venue near you soon. Come and join him for the ride.